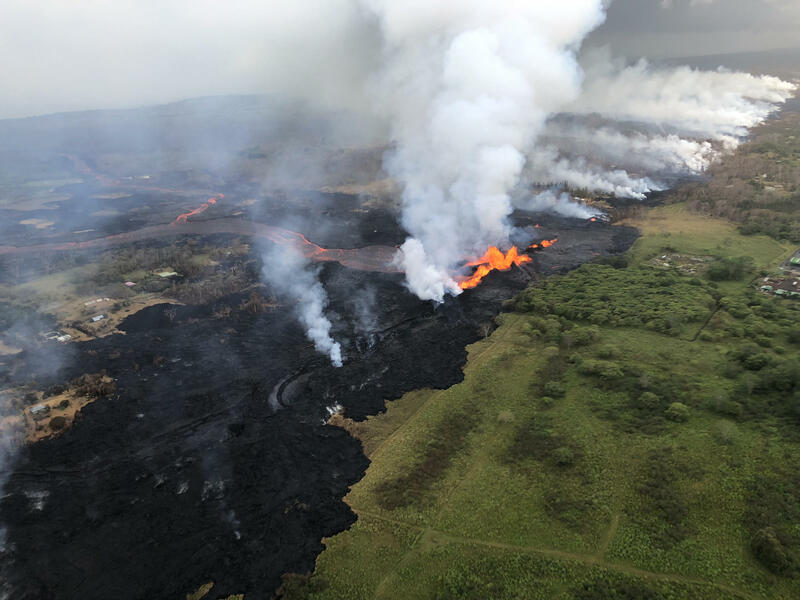 Taken Monday, 5-21-18, this photo is an aerial view of Fissure 22 with lava channels flowing southward during a morning overflight. View is toward the southwest. Kumu Hula Kekuhi Keali'ikanaka'ole from Pana'ewa. 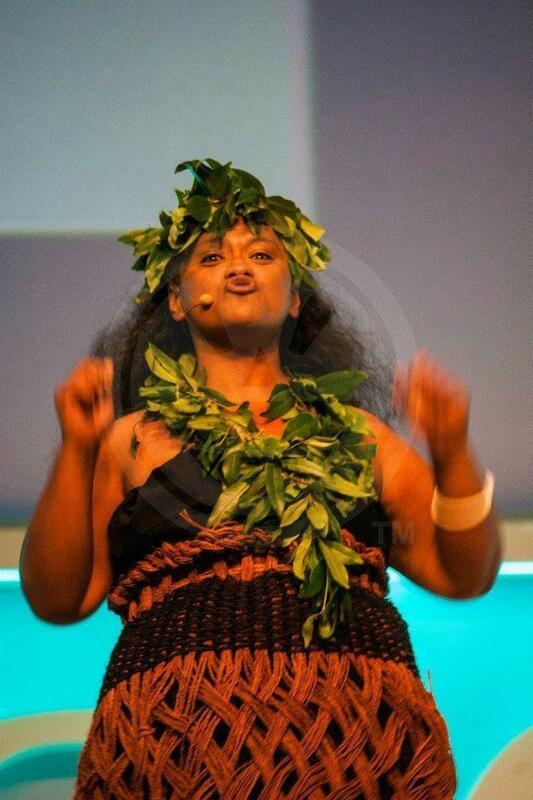 A unique and award winning singer, Keli'ikanaka'ole is a cultural expert and eighth generation hula master for Halau Kekuhi of Hawai'i island. She is also the Coordinator for the Center for Hawai'i Life Styles, at the University of Hawai'i, Hilo. Kumu Hula Kekuhi Keali'ikanaka'ole discusses manifestations of Pele and a different way to approach the Kilauea eruption. Kekuhi Keali'ikanaka'ole goes into more detail about the physical effects of Pele's activity, and into the story and significance of Hi'iakaikapoliopele. Kumu Hula Kekuhi Kealiʻikanakaʻole says these days, the air is humid and warm. Above, there are clouds that look like birds. Kealiʻikanakaʻole says, aside from obvious disruptions, there may be a reason if people are feeling extra nervous or excitable. 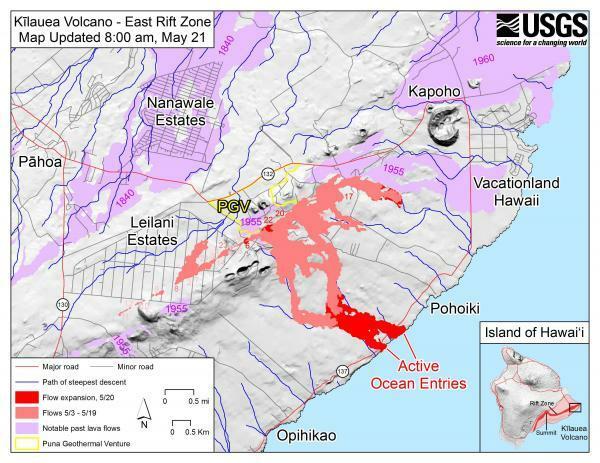 Map of the eruption on Monday, 5-21-18, courtesy of the USGS. Kealiʻikanakaʻole: There’s a quickening of energetics. There’s another force that the Pele is very responsible for and that is the magnetic force of the earth. It's magnetic and we forget because we cannot see that force, all we can know is what’s in our vision. But there’s another force the Pele is very responsible for and that’s the magnetic force of the earth. We feel that. Or I hope we feel that. I would think we would, but nobody’s talked about it. What do you mean by “the Pele”? Kealiʻikanakaʻole: I’m talking about the Pele as the element. Her primary form is lava, magma. And so when we think about the goddess, we don’t think about an extra form outside of that. We see the form that we’re seeing today on the news feeds or Facebook feeds. That’s it! She’s right there!! Kealiʻikanakaʻole: It’s creation right in the front of our faces. If we want to think of anything close to that, watch the birth of your child, watch the birth of your friend’s child. I think that’s the closest we can get to that form of Pele as a divinity. The goddess is an energy. The goddess is a resource. 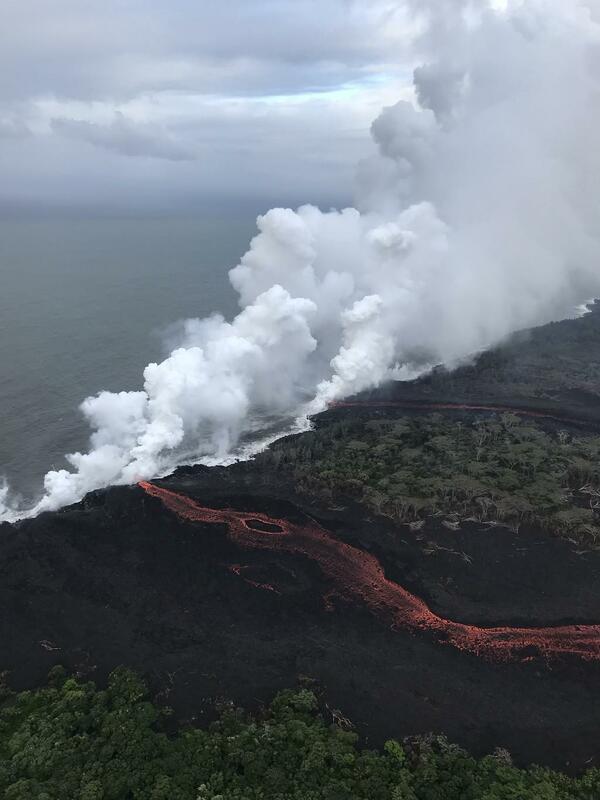 On Monday, 5-21-18, lava was entering the sea at two locations, forming "laze" fumes, a hydrochloric acid mist caused by volcanic action on salt water. Here, the wind blows laze fumes along the the shoreline toward the southwest. Kealiʻikanakaʻole: We know the island is still going to produce new land for a loooong time. That’s why, reframe the way we’re thinking about the activity that’s happening right now, reframe it! It’s not a destruction. It’s a creation. Kealiʻikanakaʻole: We don't even know when this is going to happen again, and of course we grieve the loss of houses and things, but just re-frame our community’s orientation to what it is that's really happening. Look! We’re living right here and we’re going to have stories to tell for the next one hundred years. Kealiʻikanakaʻole: Stories that we read in the Pele and Hi’iaka books now, those are the things that were happening in front of people’s eyes. So what do we do? Let’s write it down, let’s journal it, you guys. Everybody who has the opportunity to pick ash up from their windshield and go Oh my God, this was just made, and it just popped out of the earth not ten minutes ago. Write it down! Be the community geophysicist so that we have stories for our great grandchildren for the next 100 years. That's the benefit. 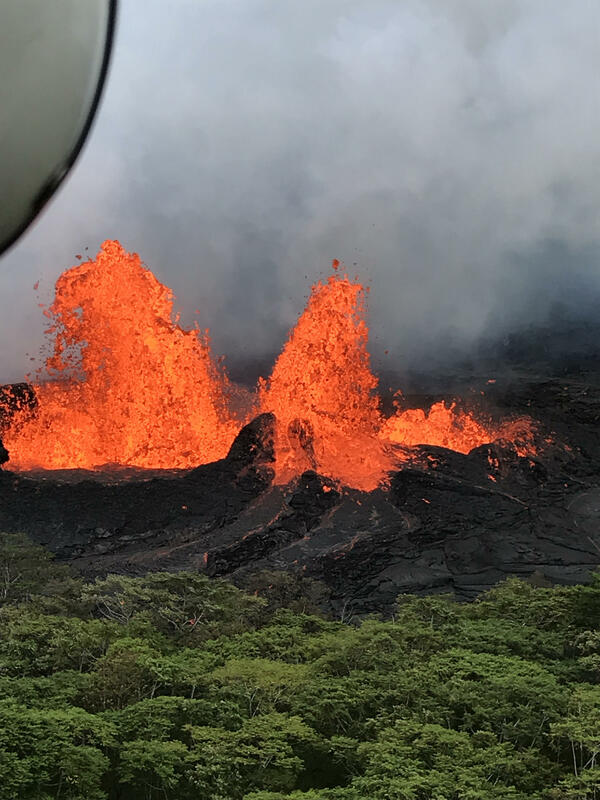 Part two with Kekuhi Kealiʻikanakaʻole continues, Connecting With the Pele, see below. The full interview, above, is highly recommended. Taken Sunday, 5-20-18, a view of lava from the eastern channel of the Fissure 20 complex flowing into a crack in the ground.